There’s not much I can add to Ryan Parker’s review of Elysium. I probably liked the film better than he did, but also thought it came up short on story. I’ll leave the Fox News economics for Paul Krugman to take apart—easily. But besides the simplistic economic analysis, Cusey’s review itself is also lacking something. Writer/director Neill Blomkamp’s vision is clearly one of dystopia caused by over-consumption by the rich and lack of concern for the poor. To read it otherwise is to reveal more about the politics of the reviewer than the film. In Cusey’s case, this is done partially in jest, but she must make all kinds of assumptions about the film that aren’t actually in the film in order for it to fit this reading. To make this assumption requires ignoring the other people selling things in what is a vast marketplace scene—not just the lady with the pigs. It is also to ignore the work that Matt Damon’s character Max and thousands of others do in the enormous factory making security droids to protect the rich on Elysium. The film tends to paint with broad strokes (one of its shortcomings) but the factory is clearly part of a vast security apparatus that must be staffed by the teaming hordes on Earth. It is clear there is a black market and rampant crime on the dystopian Earth Blomkamp imagines. Of course, when one’s labor does not lead to economic mobility, as in the Earth of Elysium, and in the United States, where class mobility is lower than other “socialist” Western nations, crime and despair are often the result. To assume that the “elites” that live on Elysium are “socialist” requires a viewer to completely ignore the actual characters in the film. The boss of the company Matt Damon’s character works for, played unguinously by William Fichtner, is shown meeting with his shareholders vowing to make the company profitable. We soon see that he’s even willing to do this at the expense of the lives of his employees. This is what capitalists do, not socialists. When the Fichtner character is apprehended by Max and the guerilla band he ends up fighting for, the corporate boss is on his way to reprogram the entire Elysium space station, placing the Homeland Security Secretary (Jodie Foster) in charge so his company can receive endless no-bid contracts to run everything both in space and on earth. Private companies setting economic policy to increase their bottom line at the expense of the rest of society is what capitalists do, not socialists. From a faith perspective, Cusey’s view, in which the poor are largely responsible for their position because of their own lack of initiative, seems to come from a pull-yourself-up-by-your-bootstraps Protestant work ethic. The problem is that in recent years, the Protestant work ethic–what was once a conservative interpretation of Christianity that encouraged personal effort–has mutated. It has been merged with libertarian free market capitalism to the point that many conservatives believe the systemic economic situations that lead to cycles of poverty do not even have to be considered, much less addressed or overcome. To put it briefly, many conservatives, even conservatives of faith, believe that the poor should pull themselves up by their bootstraps–despite not having boots. In defiance of Biblical admonitions, this strain of American libertarian capitalist Christianity leads people to believe that personal wealth is no impediment to one’s salvation. What matters is solely personal adherence to a set of (mainly sexual) morals and belief in “Jesus Christ as Lord and Savior.” So it doesn’t matter how wealthy one gets, or if the world is stratified into an economy of a permanently rich capitalist class and a perpetual underclass, because God will sort things out according to one’s proper religious dogma in the end. This heretical idea of Christianity is how John Schnatter, who revolutionized the world of pizza by including butter sauce to dip the crusts in, is worth 300 million dollars, lives in a 40,000 square foot McCastle with a 22 car garage, and is a prominent member of one of the country’s largest megachurches. Yet Schnatter cannot countenance a 5-9 cent raise in pizza prices in order to provide market-based (not socialist) healthcare to his workers, who will work for the benefit, not receive it for free. No, this isn’t a matte painting of the space station Elysium, it’s “Papa” John Schnatter’s house. Apparently he will lose everything if he offers health care to his workers. I’m not sure how far Cusey’s personal beliefs match American libertarian capitalist Christianity beyond her review. She seems to be concerned for the poor, but has unproven ideas about how capitalism can actually benefit them. In a follow-up post to her review of Elysium, she makes it clear that she sees the United States as a benevolent capitalist country which (thanks to George W. Bush) spreads its largesse far and wide to help the poor people of the world. One wonders if Cusey shares most Americans’ misperception that America spends a large amount of its annual budget on foreign aid. The average American thinks our country should “cut” foreign aid, and when pressed to give an estimate, thinks America spends a quarter of its budget helping out other countries. In fact, the United States, the so-called “Christian Nation,” is the stingiest of wealthy nations, donating about 1 percent of its annual budget, or about 0.2 percent of its annual GDP , to foreign aid. Heathen atheist socialist dystopias like Sweden, Norway, Denmark, and the Netherlands lead the list in foreign aid as a percentage of GDP. Americans bragging about how much their virtuous capitalism benefits the world while countries with much smaller economies give a larger share reminds me of Jesus’ parable of the Widow’s mite. What most reviewers didn’t seem to get about Elysium is that this is not a “future” dystopia. The world in which children die of curable ailments, where living in relative wealth or squalor depends on imaginary geographical boundaries, where one’s labor goes to benefit a greedy oligarchy of a few wealthy families, already exists. It exists on a domestic scale in the United States, and it exists on a global scale between the United States and the Two-Thirds World. The tragedy of the United States is the loss of a prosperous nation where there was once a functioning and growing middle class, the possibility of social mobility and wage growth based on rising productivity, and a capitalist elite that had a least a modicum of noblesse oblige, in part because of establishment churches that stressed social responsibility along with personal salvation. The tragedy of the United States in comparison with the rest of the world is that we still have so much—clean water, food resources, education, very good medical care that some of us can afford, relative peace and stability—which we feel we must hoard against the grasping masses of the rest of humanity. You and I, if we’re participating in this discussion, are already living in Elysium. 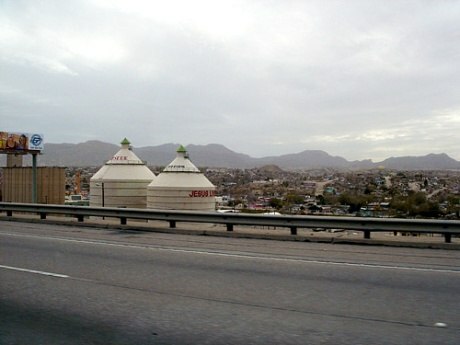 Take a trip on I-10 through El Paso sometime and look across the ditch into the Third World of Ciudad Juarez, the most dangerous city in the world. On one side of the highway is poverty and misery on the scale depicted in Blomkamp’s film. On the other side is Target and Wal-Mart—capitalist Disneyland. Ask yourself what you did to deserve being born on this side of the highway. What did you do to deserve living in Elysium? If you can’t think of an answer for that, ask yourself what you’re willing to do for the people of Earth. I-10 in El Paso, the highway on this side of Elysium, looking across the border to Mexico.